My partner Albert gave this talk at DLD 2019 a couple weeks ago. Starting and investing in startup companies is a long lead time business. It takes on average seven to ten years for the seed and early stage investments we make to turn into something. So looking at data across the entire VC landscape can be confusing. Important trends can be lost in the noise. The first one tells a troubling story. 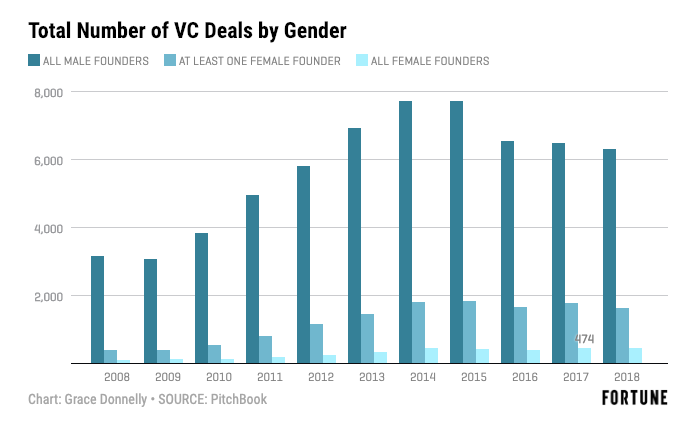 Female founders are getting a tiny amount of the supply of venture capital and the percentages are not changing much. The second one tells a promising story. 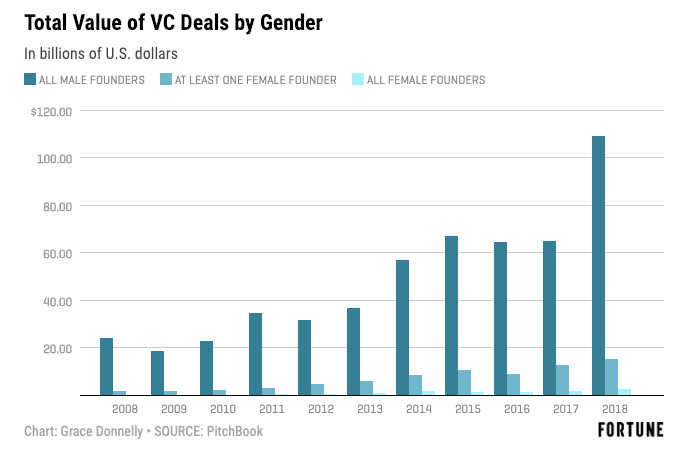 The percentage of teams getting funded that are all male founded is declining and the percentage of teams that have women founders on them, or are all women founders, is rising. The first chart is dominated by late stage companies (think companies that are 5-10 years old) and the second chart is dominated by earlier stage companies. Let’s look at this data in five or ten years. 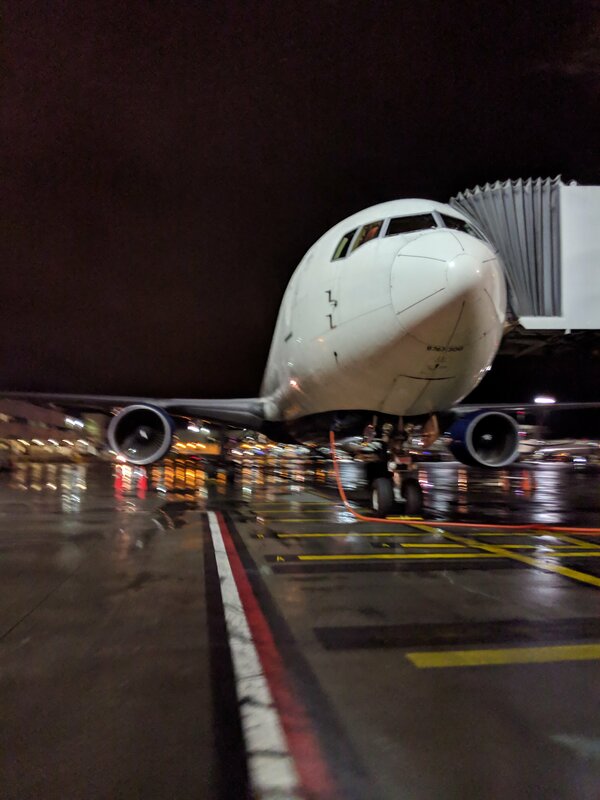 I think we will see a different story. I don’t have the exact data on me and it would take more time than I have right now to calculate it, but my guess is that over the last four years, about thirty to fifty percent of the teams we have funded have had at least one woman founder on them. The times are changing in venture, thanks to the hard work by a number of women founders, women angels (like The Gotham Gal), venture capitalists, and some men too, and it is having a big impact. We just can’t see it in the aggregate funding numbers yet. Two weeks ago, my colleague Nick traveled to Hong Kong to attend a Blockstack event (Blockstack is a USV portfolio company) and deliver this talk, which covers some important questions/issues in the crypto sector. This short tweetstorm sets up the video well, so I will start with that and follow with the video which is 17mins long. In a nutshell: On the one hand, we have the "agile" approach to building apps: start small and iterate quickly. On the other hand, we have "immutable" decentralized systems, which are — by design — stable and hard to change.